When launched in 1913 she was christened as the Katoomba, a 466-foot-long passenger and freight hauler for McIlwraith & McEacharn Shipping Co. of Melbourne. 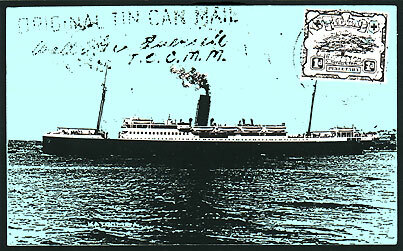 Her profile was typical for ocean steamships of the day. She offered a single funnel and two masts and a low superstructure. There were accommodations for 52 first class and 754 tourist class passengers, which meant that cabin space was limited. One artist's concept shows sails hoisted, suggesting that she had sail capability in the event of engine failure. There is record that the Columbia, indeed, drifted on the North Atlantic for two days in October, 1952, in the midst of a storm, because of a broken shaft and screw. Obviously it was not equipped for sail motivation then. By then the ship had been "modernized" with oil powered engines that replaced the old coal fired boilers. The Katoomba served its Australian owners on regular trips between Sydney and Fremantle until England entered World War I. 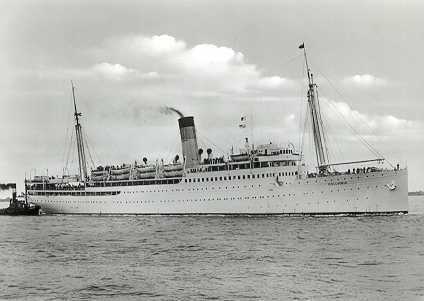 Then Katoomba served as a troop ship for both world wars. She was sold to a Greek Shipping Line, Cia Maritima del Este, in July, 1946. This company refitted the old steamer, installed new oil burning engines, fitted her with extra lifeboats, painted it white and renamed the ship Columbia. After this the Columbia literally sailed the seven seas. She appeared to be operating almost on a charter basis, making unique trips to and from world ports, but rarely operating as a regular service ship until 1950. In July of that year Columbia began regular voyages between Montreal, Quebec and Piraeus. She made seven consecutive crossings and then the following year sailed from the Canadian ports to Cherbourg, Southampton and Bremen. In 1957 the aging ship came under management of Neptune Shipping Co. of Panama and made voyages between Liverpool, Belfast and Quebec. On October 18, 1957, she was in a collision with the Homeric at Quebec, in fog. The damage appears to have brought an end to the Columbia. She sailed from Quebec to Southampton, then on to Piraeus where she was laid-up. Two years she steamed to Nagasaki, Japan, where she was scrapped.